Seeme & Liz > Play Based Learning Articles (2-4 year olds) > Indoor Camping Ideas For Kids To Spark Learning! Camping might not be for everyone, but indoor camping with the kids should definitely be an exception if you are camping averse. In this article I will share with you some fun indoor camping ideas for kids that are great for a rainy day/night. And I’ll also explain the learning benefits that arise out of this kind of pretend play activity! You can make indoor camping as simple and budget friendly as you would like, or you can turn it into an extravagant event. 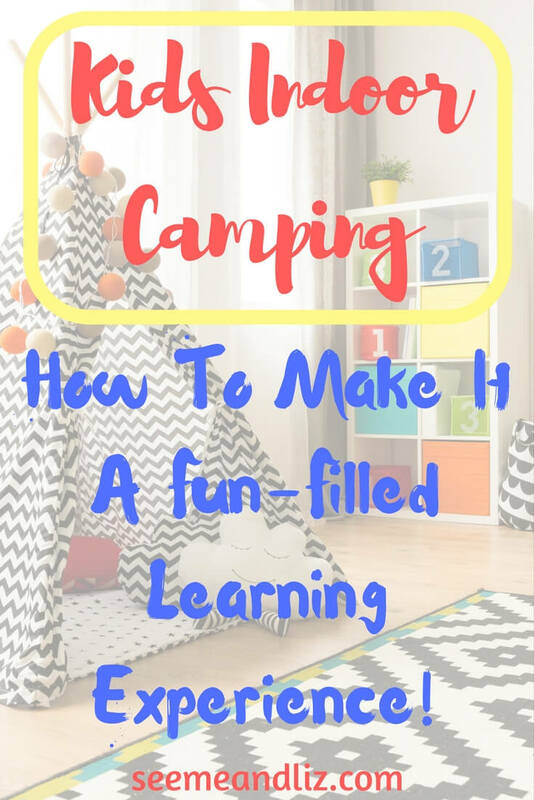 If you homeschool or have a home based daycare, you could set up a camping area in your house and keep it there for several weeks, targeting different areas of language development and learning during that time. Theme based learning is a great way for kids to gain new vocabulary and skills. 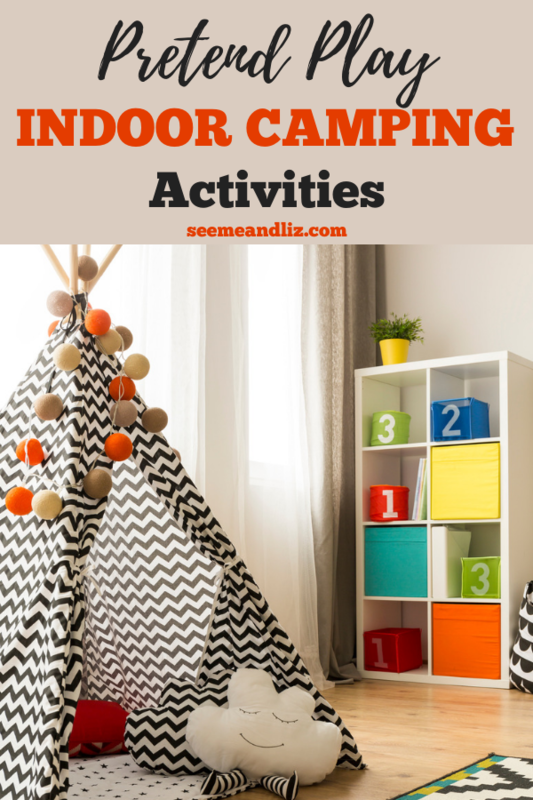 Indoor Camping Ideas For Kids – Learn and Play at the Same Time! Here are some items you will need for your indoor camping experience! You can either make your own fort using blankets and chairs or use a kids tent or teepee. But be prepared for some collapsing if you are making your own fort. You can also purchase some adorable cloth “cabins” and teepees that make a nice alternative to the DIY tent. These are great because children can use them for anything they come up with, their use is not limited to only camping! If you have chosen to build your own tent/fort, talk to your child about what supplies would be needed. 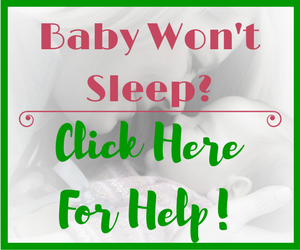 How you go about this will vary depending on the age of your child. If you are using a pre-made tent or cabin, you can talk about the steps involved in setting these up. Keep in mind that the above teepee and cabin are not “pop up” style. This means you have to assemble them and take them apart. These are meant to become part of your child’s play area. This would be more for older children, but can still be done with younger ones depending on their language level. Discuss why we need shelter when we go camping and what might happen if you just went outside and slept on the grass. You may be surprised at the answers your children will give you. What camping trip is complete without a campfire? You can make your own pretend campfire following the steps below, or you can purchase a cute ready made one such as the one in the picture. If you want a more realistic campfire that will light up, place some LED tealights in it. These can be purchased at most dollar stores. Simply roll the brown construction paper into “logs”. Tape or glue them so the don’t come apart. If you are able to get some pool noodles (thin ones, not too thick) they would help to make the logs sturdier. Cut the pool noodle into about 4-6 logs and then wrap the brown construction paper around them. Secure with tape or glue. Next fold/crumple the tissue paper to make flames. Last scrunch up the black construction paper to form rocks. Once you have all of the fire parts made, assemble them into a campfire (similar to the pre-made one in the picture above). Place the LED tea lights in between the logs and flames (this can also be done in the S’more The Merrier Campfire Set). Talk about why you would need a fire when camping (cooking, warmth, providing light). Discuss fire safety – if your children are over the age of 3 include “stop, drop and roll“. Talk about the kinds of food you could make using a campfire. There are so many foods that you can make while camping (indoors or outdoors). This would become a very long article if I talked about all of them, so instead I will discuss the campfire classic – S’mores! 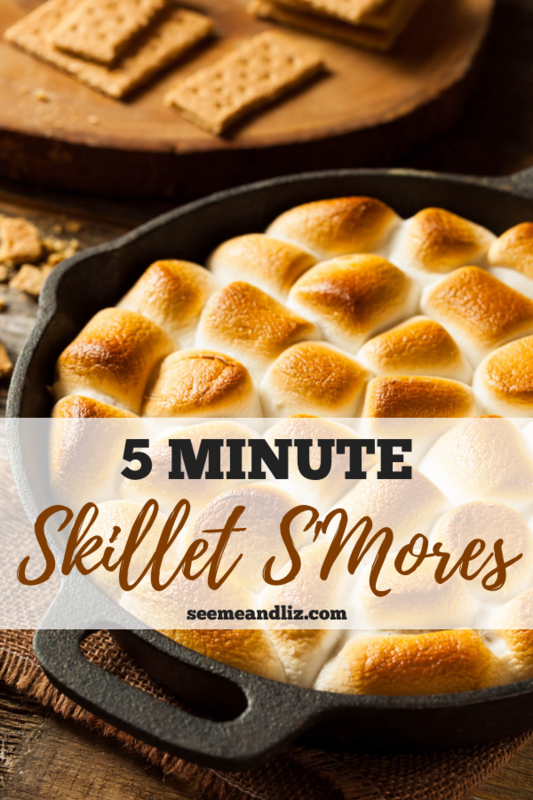 Here are 2 quick ways that you can make s’mores at home without needing a real campfire. Wait for it to cool down a bit before eating. Enjoy! Place marshmallows and chocolate chips into the waffle cone (about 1/2 to 3/4 full). Then wrap the cone in tinfoil. In order to prevent the marshmallows from sticking to the tinfoil you can try placing some parchment paper on top of the cone prior to wrapping with tinfoil. Place the wrapped cone on a cookie sheet and bake at 375 degrees for about 8-12 minutes (flip the cone over at the halfway mark). Be careful, it will be very hot when you take it out! You can place more than one cone on a cookie sheet. Preheat oven to 450F with a cast iron skillet inside. Once hot, carefully remove the skillet and coat evenly with butter. Place the pan back into the over and bake for about 5 to 7 minutes (until marshmallows are golden brown on top). Use the graham crackers to scoop up the ooey gooey melted chocolate and marshmallows! Come up with a list of all the foods that could be taken on a camping trip (your child can write these down). Gather up all your play food to bring along on your indoor camping adventure. Talk about foods that would need to be kept cold and which ones don’t. If your child is old enough have them help you make the s’mores. You can give them the steps that they need to follow which is a natural way to work on following (and giving) directions. When Will You Go On An Indoor Camping? Setting up an indoor camping trip doesn’t need to be complicated. If you are a DIYer you can make most of the items discussed yourself. Or check out this article for some wonderful pretend camping toys for kids that I have hand selected! 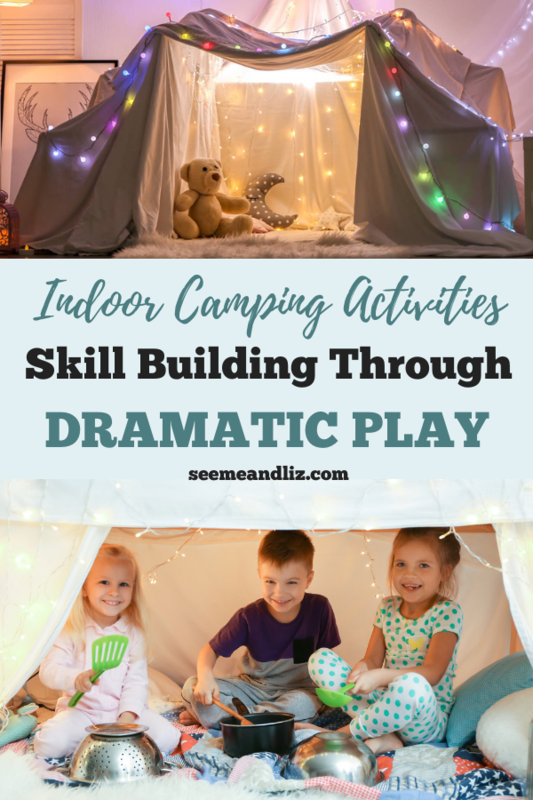 I hope that you have enjoyed these indoor camping ideas for kids and have realized how simple it is for children to learn a great deal while they are playing! Have you done any indoor camping with your kids? If not, what is holding you back? This is something for the kids of my sister, they are old enough to do that now, in matters I mean they are more than 2 years old, so you can trust them. And it is like you say, you can teach them things and have fun with them in the same time. I will show this to my sister, she will be happy. Thanks for passing my article on to your sister Emmanuel! I hope she likes it as much as you do. I love all the ideas your have shared about indoor camping with kids. I would never have guessed that something so simple could be packed with so many opportunities for learning. And the best part is that the kids are having fun and not even realizing that they are learning. It’s a much different approach than having them sit at a desk filling out worksheets! 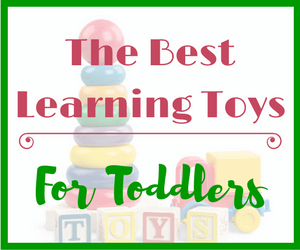 Learning through play is how young children gain the most skills. Sitting a desk can wait! Thanks for leaving a comment. This just looks so much fun! I love the instructions you give to make your own too, very helpful and fun to make things together too. I quite like the products you selected too, because they are good gift ideas! Actually I’ve found that your site has some really good resources on it, so thank you for this, I’ve been finding out all sorts of helpful stuff! Thanks. Thanks so much Lucy! I’m happy to hear you enjoyed the article and have found other helpful resources on the site. Let me know if you have any questions. What a fantastic idea. I live in a place where camping is not the easiest of the things to organise, and it would take us a long drive just to get somewhere where we could actually safely camp. I will definitely take you up on the idea, it is fun, but mostly I like the idea that you can turn it into an educational experience for the kids and why not even for us adults. Thank you very much for the tips on how to do it. Glad you liked the article Barbara! There are so many natural learning opportunities for children that don’t require structure and worksheets. 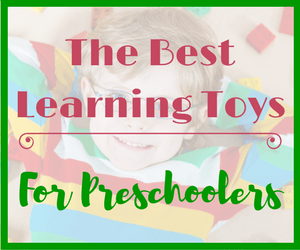 Children learn best through play! Both guided play and unstructured play. One of my cookbooks has that second oven smores recipe. What I like to do to make smores at home is add peanut butter. It helps keep the chocolate attached to the graham cracker. I cook them in the toaster oven. They get perfectly cooked in there. Such great ideas for indoor camping. I remember throwing blankets over items to make my own fort and chilling there as a kid. It was a lot of fun. Even more so when other people joined. I love your idea of adding peanut butter to the smores recipe Nicole! I will have to give that a try. I also haven’t tried making them in the toaster oven. Indoor camping is so cool for our children. The camp fire preparations are so unique. Haha but when I was a child I wasn’t exposed to such an indoor camping. Children of these days are privileged to learn things like this. This can enhance the skills and creativity of a child including fast learning. Thanks for your comment Kenechi! When I was a child my indoor camping experience consisted of an old sheet thrown over 2 chairs. So it wasn’t anything like this. Kids love building forts, whether or not they consider it camping. Awesome article! I really enjoyed the reading. My children are already adults, but my sister has a little boy, and he loves this kind of stuff. He has the second tent on the list, and I think he will be glad to have another one:) Soon he will be four years old, so some more camping toys would be an excellent present for his birthday. Do you have any suggestions for camping toys for four year olds? You should take a look at Pretend Camping Toys For Kids – These 8 Are Must Haves! for some ideas for camping toys for your nephew! Thanks for providing this article, I must admit I am very adverse to camping; but it is something my kids are keen on trying. An indoor camping experience sounds like a great way to approach this, I love how you have suggested the ways it can be made educational as well. I’ll be giving this a go this weekend. You should definitely give indoor camping with the kids a try! I’m sure your kids will love it! You gave me an amazing idea with your article. My two little boys love to play indoors when I create a small house with our bed sheets so getting a small shelter and camping equipment they will definitely go crazy with it. And accompanying all these with some nice food completes the setting. I will pass this article to my wife as we always look for new ways to make our little boy’s day exciting. Thank you. I’m sure your boys would love to pretend they are camping inside! Here’s a great list of pretend play camping toys I put together. What an absolutely great article. We are avid summer time campers but considering how bad our winters get we refrain from winter camping. Our grandson who is 7 is always making forts in his bedroom and telling us how he is winter camping. I love how you show us how to make it interactive and make it a fun learning occasion. Thank you for taking the time to research and write such a great article. I’m so glad you enjoyed this article. I want parents (and grandparents) to see just how easy it is for children to learn while playing and having fun! 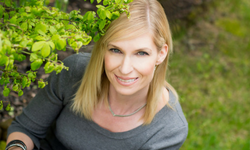 Your indoor camping advice is so wonderful and it’s a great way to bond with your children. I love the improvised idea on the campfire through the use of led lights. I was about thinking that camping wouldn’t really be complete without a campfire and that is hard to do when indoors! Thanks for writing this wonderful piece. Thanks Salim! You’re right, all camping trips (indoors and out) need a campfire. I’m happy to hear you enjoyed my suggestions for indoor camping with kids! I just want to say, what an amazing article! I don’t think I know anyone who has not built many home forts as a kid and this brings back many great childhood memories. Thanks for that! This is a great idea for a DIY kids/ family night. I also found the 7 DIY play forts article very helpful so thank you for that as well. Thanks for the great parenting advice! My son has actually transformed his bed into a fort/tent. He’s 9 and still loves this kind of thing! Indoor camping is such a fun activity for kids of all ages. Oh, they have come a long way in indoor tents and stuff for little kids. I can remember when my son was little and we did the camping tent and forts inside. What you have on your post – they are too cute. I like the smores recipe, we will have to give it a try 🙂 We have always just did it in the microwave which actually isn’t too bad either. Thank you for sharing! 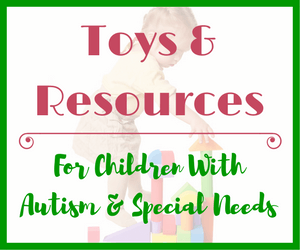 Yes, there are so many more toy options available nowadays. Some are great, while for others I often wonder “what were they thinking?“. Building forts and pretending to go camping was one of my favorite activities as a child. I would have loved to have that indoor camper! But chairs and blankets also work. These are absolutely cool ideas! Thank you so much! I have never really been into camping, but I have to be ready in case my daughter asks for it in the future. And since these are just such lovely ideas, it got me excited to do this with my daughter. I love the camper kids playhouse and especially the campfire! Yes, they really are Raquel. I also love the kids camper! If my kids were a few years younger I would definitely be buying one for them. There is no reason to be bored with one of those! I hope you and your daughter have a great time doing some fun indoor camping activities. This article reminds me of my enchanting days as a child and how my imagination use allowed me do these types of activities and how pleasurable it was following my fun imagination. I still have my child like sense of humor, and when I see boredom or temper form in my 1 year old, these are the kinds of activities I encourage and promote. This is beautiful. Thank you for the little ideas I can now create for my toddler too. It is wonderful that so many of us have fond childhood memories of camping indoors. Children’s imaginations and creativity really come out through the most simplistic activities! What an awesome website! I remember making structures indoors like this when I was a child but this just takes it to a whole other level. I never realized that so many products existed for this specific purpose. Those tents and that campfire look so realistic. Kids gotta have a blast camping indoors with these things. Thanks for the great tips. I will probably get some of this stuff for my nephew. Thanks again!! I too have fond memories of indoor camping when I was a child! But all we had were chairs covered with blankets. I would have loved the camper and firepit! My sister and I would have spent hours camping in the house! Hi I enjoyed your article because it was most unusual. I remember fixing up camping things in the house for my children when they were young. We used to like making dens etc and it was so much fun. Though when they were bigger we did go camping outdoors and they didn’t think it was as fun as in the bedroom, lol I don’t think they liked the cold at night. I love having these memories as well. 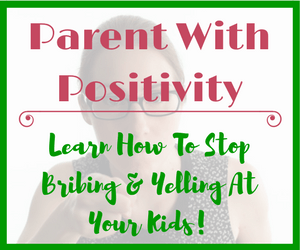 My sister and I had so much fun building forts and now our kids love this activity just as much. We take our children camping (we have a small camper) and the kids love it. If they didn’t enjoy it so much I would probably stick with the indoor camping more. Growing up we always used to build ‘indoor dens’. It would typically be in the back room of the house where we would push the sofa out away from the wall. We would then simply drape a blanket over the top and take it from there. Sometimes this would stay there for a few days or if people were coming around it would disappear sharpish! It’s great to see that my kids now are also building their own indoor dens. We’ve certainly had the artificial candles in the den but we haven’t had a pretend fire. That’s a great idea (and totally safe!) and it’ll make it all the more exciting for them! Dylan, I too remember setting up forts in my basement as a child. And now it’s great getting to see my kids enjoying the same activities. We actually got them a fort/tent building kit called Crazy Forts (affiliate link). So they will switch between a “den” with sheets and furniture, building a crazy fort or using their pop up tent. Definitely try the pretend fire. I’m sure the kids will love it. You can also put marshmallows on a stick and pretend that you are roasting them. My kids actually prefer unroasted marshmallows. And they aren’t too messy that way.